Sebi loves noodles and apparently hearts bone broth, too! 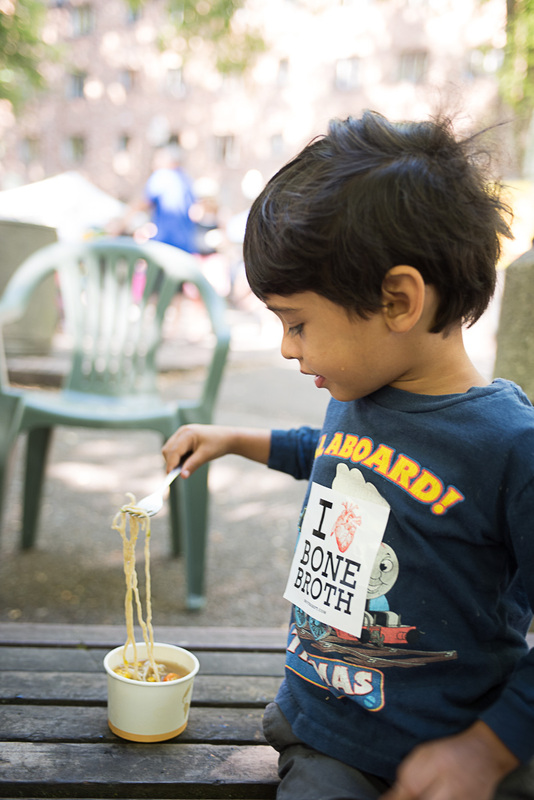 We sampled our noodles with beef bone broth at the downtown Portland farmers market in early September. Photo by Shawn Linehan. In the fall of 2016, we teamed up with Tressa Yellig, the owner of Broth Bar and a bone broth making wizard, for a three-part ramen pop-up. Our concept was to embrace the building blocks of ramen (fat, meat, ocean, noodle) and play with seasonal ingredients. 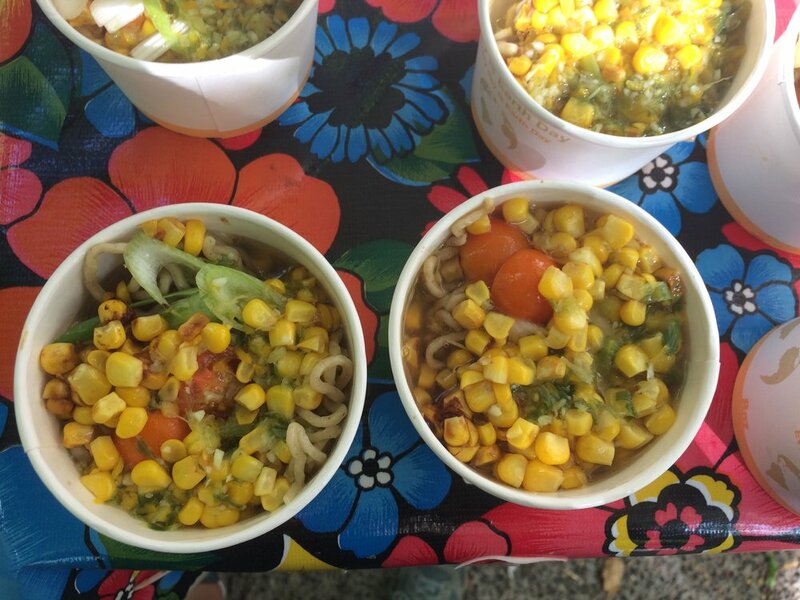 The results were three very different and very wild soups. This one was our favorite. It's foundation is a many-hour simmered beef bone broth that rumbles with depth and strength. We layered on top of that a carrot-ginger-fish sauce flavor base, our version of a Japanese "tare." In Japan, ramen typically includes a strong seasoning liquid that takes broth and punches up the salt and umami. This is what's called the tare. A "shio" ramen means this liquid was made with salt. "Shoyu" connotes a soy sauce base. Every version may include ingredients like sake, green onion, or ginger. Our carrot-ginger-fish sauce tare is very bright, very lively, and a nice contrast to the beef. Toppings for this soup can vary, but we love the corn-cherry tomato combo because the sweetness adds an amazing high note. And what brings it all together for us, of course, are springy, bouncy Umi noodles. We really think this bowl is a winner! We're including Tressa's recipe for beef bone broth at the end, but you can buy it from various groceries, and you can substitute beef stock if that's easiest for you. But make sure it's unsalted or else you might really blow out your tastebuds! This one has a lot of flavor! Small samples we dished out at the Portland Farmers Market when we demoed this dish in early September. 1. In a small skillet, toast dried shrimp over medium heat until they release a toasty smell and darker slightly in color. Set aside. 2. Pulse dried shrimp, carrot, garlic, ginger, green onion, and sea salt in a food processor until it becomes an almost uniform paste. If you don't have a food processor, mince the dried shrimp, carrot, garlic, ginger, and green onions . 3. In a sauce pan, add the carrot paste and sake and fish sauce and bring to a low simmer over medium heat. Cook for 5 minutes. Remove from heat and let cool. Set aside 3/4 cup tare for this dish. Put the rest in a container in your fridge or freezer for later. 8. In three deep bowls, add 1/4 cup carrot tare and 10 ounces hot broth. Divide noodles between bowls and swish noodles in broth to loosen. Garnish with corn, tomatoes, optional shrimp, scallions and a swirl of olive oil. Taste and adjust saltiness with fish sauce. Enjoy! It's important that your broth simmers at a steady temperature, ideally 180 to 200 degrees. If it rises about 200, you will eliminate some of the most nutritious elements in the bones. Many crockpots cook at higher than 200 degrees. You can test yours by adding water, heating it, and then taking the temperature. If there is a lot of meat on the bones, roast them first for flavor at 450 degrees for 30 minutes. 1. Place the bones in a medium stock pot and add water to cover. 2. Mix in the splash of vinegar and allow to sit at room temperature for 1 hour. 3. Bring the pot up to a gentle simmer (about 180˚F) and allow to continue for 8 to 72 hours. Periodically check to make sure the temperature does not raise about 200 degrees. 4. Add the vegetables in the last hour of your cooking time. 5. Strain out the bones, vegetables and herbs and allow to cool. Package in glass containers for fridge storage. Broth will be good for two weeks in the refrigerator. Package in plastic freezer bags or ice trays for freezer storage. Broth will last for 6 months in the freezer.